These Black Christmas movies are on my favorite list of Christmas movies because they are great to watch during the holidays or Christmas Break. 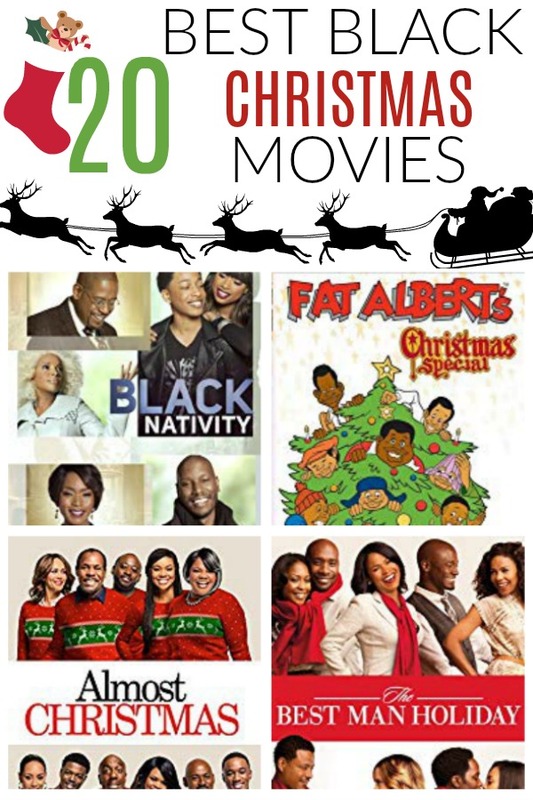 These titles feature family-friendly, romantic, and comedic African-American storylines. These Black Christmas movies feature some of my favorite Black actors including Tyler Perry, Queen Latifah, Morris Chestnut, Danny Glover, Angela Basset, and more. Laughter, love and a just a hint of magic make a fun-filled comedy romance. All she wants for Christmas is to meet a nice man. So when her little girl shares Mommy’s wish with smitten shopping mall Santa. Based on the Langston Hughes play, this beloved seasonal story to be adapted by Kasi Lemmons is set in present day Harlem. A new comedy from David E. Talbert that tells the festive story of a beloved patriarch who asks his family for one gift this holiday season: to get along. A Chicago social worker (Cicely Tyson) helps a jazz saxophonist (Michael Warren) adopt a son (Trent J. Cameron) after losing a wife. In another part of Philly, the Cosby Kids are rehearsing for a Christmas pageant at their junkyard clubhouse, which Tyrone, the mean old junkyard owner, is fixin’ to tear down. That’s when Marshall & his parents show up. With their car broken down, Marshall’s mom is about to have a baby and his dad, without health insurance, inspires the gang to invite them in the clubhouse for shelter. Tyrone agrees to let them stay until the baby is born, in exchange for Fat Albert working for him as a sidewalk Santa. “Ho-ho-ho’s” in Fat Albert fashion ensue. After the old hobo, Mudfoot, gives Tyrone a lecture about how he’s been grumpy at the world ever since his wife died, the junkyard owner has a change of heart and promises to keep the gang’s clubhouse in tact. A new twist on an old classic, this VH1 production may not look like the Dickens favorite, but it’s true to its spirit. “Ebony Scrooge” is a miserly Diana Ross-type singer. She was once part of 1980s trio Desire, but one of the members was killed in a car crash and Ebony abandoned the others for a solo career. While in New York for a “charity” concert–designed to benefit her more than anyone else–Ebony is visited by four spirits. First comes Marli, followed by the Ghosts of Christmas Past (Suddenly Susan’s Kathy Griffin), Present (Duran Duran’s John Taylor), and Future. The last is a tragically humorous episode of Behind the Music, featuring cameos by Nile Rodgers and Brian McKnight. It’s enough to make a diva change her wicked ways–some of them, at any rate. A reunion between college friends reignites rivalries and romances in this heartwarming comedy. Share the laughter, love, and surprises as the whole cast returns in the long-awaited sequel. Remake of the Cary Grant classic where an angel comes to earth a few days before Christmas to help a disillusioned reverend regain control of his life. It’s Christmastime in the ‘hood, and those crazy cousins, Craig and Day-Day, have finally left the security of their parents’ homes and moved into their own apartment. An ambitious married woman gets more than she bargained for when her wish to be single again is granted. She awakens to discover she’s got everything she’s ever wanted, except her husband. She resolves to find him a second time. It’s right before Christmas and high-powered businessman Howard Langston is fighting a shopping war in order to buy his son the hottest action figure of the season — Turbo Man. Ving Rhames is a drag queen that comes face to face with his toughest act ever. Fatherhood. The far-flung members of the Rodriguez family converge at their parents’ home to face what may be their last Christmas together in this heart-warming holiday comedy. When Harlem schoolteacher Dorothy tries to save her dog from a storm, she’s miraculously whisked away to an urban fantasy land called Oz. After accidentally killing the Wicked Witch of the East upon her arrival, Dorothy is told about the Wiz, a wizard who can help her get back to Manhattan. As Dorothy goes in search of the Wiz, she’s joined by the Scarecrow, the Tin Man and the Cowardly Lion. Madea serves up her own brand of Christmas Spirit when she gets coaxed into joining a friend and her family in the country for the holidays. It will take Madea to save this special Cape Cod Christmas and make it into a foot-stomping good time. Filled with great music, and enough laughs to fill your holiday season with joy. Hard times and holiday tensions teach a father what Christmas is all about in this family-friendly drama starring Ruben Studdard. The fun begins when the rich and greedy Duke Brothers wager a bet over whether born loser Valentine could become as successful as the priggish Winthorpe if circumstances were reversed. DO YOU HAVE ANY FAVORITE BLACK CHRISTMAS MOVIES?